The effect of water temperature on fish is of incredible importance. Different fish can tolerate different water temperature ranges and, as cold blooded species, can suffer or die if they are subject to temperature outside of their range. They will also need a specific range of temperatures for successful spawning and will also have a specific preferred range of temperatures where they are most likely to be found and be most active. More on this in another post. Coldwater: Fish that have an upper lethal limit (adult) of approximately 25°C. Examples include member of the trout and salmon families. Warmwater: Fish that have an upper lethal limit of as high as 36°C or more. Examples include carp, channel catfish, bluegill and largemouth bass. 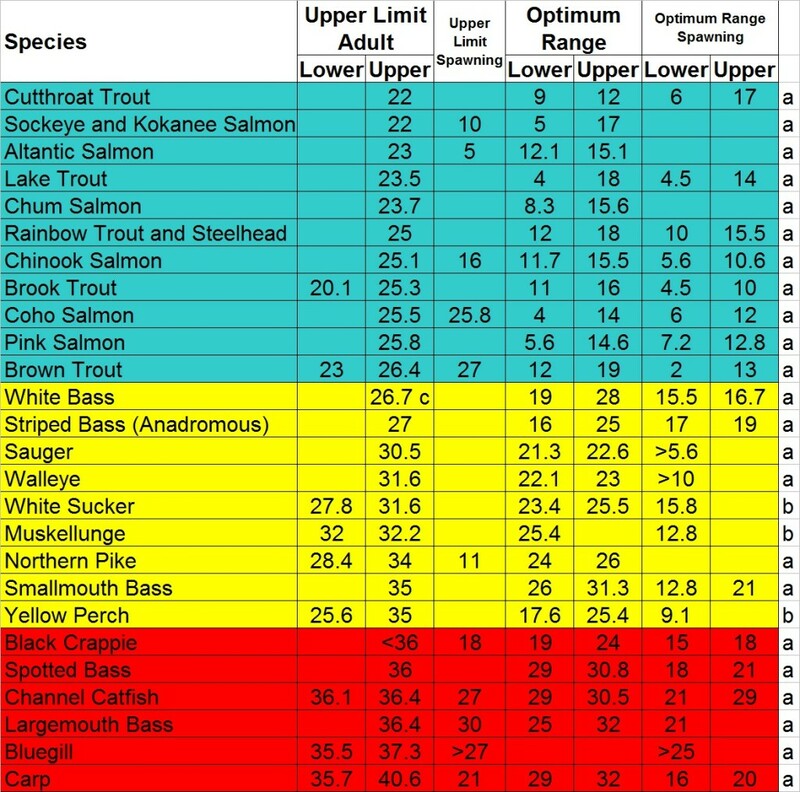 Coolwater: Fish that have a slightly lower lethal limit than warmwater species and generally require cooler average temperatures during the growing season. 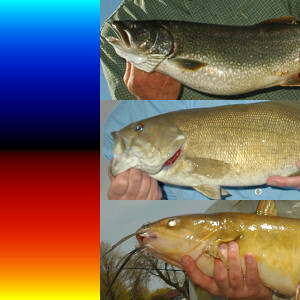 Examples include northern pike, walleye and smallmouth bass. Table 1. Species classification based on upper lethal limit (adult) in degrees Celsius: Blue – Coldwater, Yellow – Coolwater, Red – Warmwater. Upper limit for spawning, optimum range and optimum range for spawning are also shown. Of course it is possible to have species from each category present in a single waterbody, albeit in different areas. For example, a river system I regularly fish would generally be considered a coolwater system overall with northern pike, smallmouth bass and walleye being prime gamefish of interest. I have, however, also caught largemouth bass in shallower and warmer bays and lake trout and cisco from deeper, coldwater areas – all of these spots are less than a kilometer away from each other. Table 2. Species classification based on upper lethal limit (adult) in degrees Fahrenheit: Blue – Coldwater, Yellow – Coolwater, Red – Warmwater. 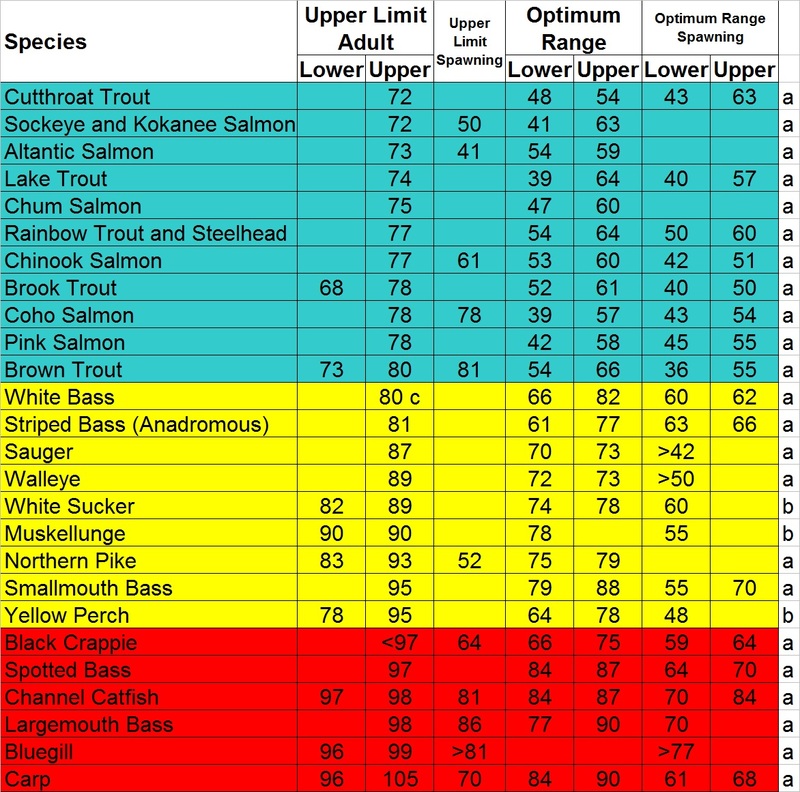 Upper limit for spawning, optimum range and optimum range for spawning are also shown. a) J.V. Morrow, C. Fischenich “Habitat Requirements for Freshwater Fishes” EMRRP May 2000.
b) S.S. Hasnain, C.K. Minns, B.J. Shuter “Key Ecological Temperature Metrics for Canadian Freshwater Fishes” ISBN-978-1-4435-2279-3, 2010.